To get a list of all options, run the base station software (E.g bnetz) with no parameter or '-h' or '--help'. bnetz.c:268 info   : Entering IDLE state, sending 'Gruppenfreisignal' 2 on channel 1. Base station ready, please tune transmitter to 153.010 MHz and receiver to 148.410 MHz. To call phone, switch transmitter (using pilot signal) to 153.370 MHz. 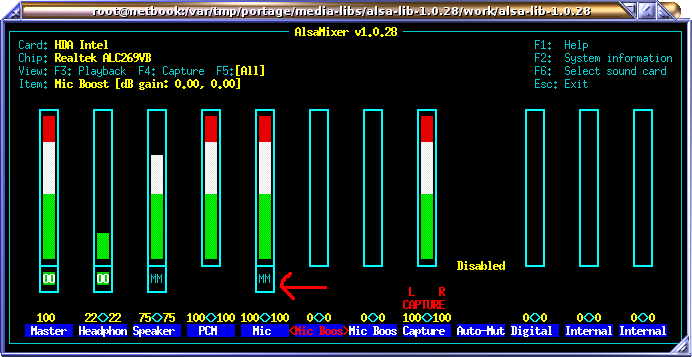 To adjust input and output levels of your sound card, run 'alsamixer'. To avoid echo of audio input (mic), mute the input (select item and press 'm'). We want to capture microphone, but not echo it back to the audio output. Also we want audio on line/headset output and capture from microphone input. Do not use input gain on the microphone. Now we want to calibrate transmitter and receiver audio level. Run the B-Netz base station in loopback test mode (-l 2). Even if you plan to setup A-Netz base station, use B-Netz base station for calibration. Tune your transmitter AND receiver to 153.010 MHz. Press the PTT button on you transmitter and talk into it. Check if you hear your voice at a normal level from the receiver. Then connect the audio output (headphone) of your sound adapter to your transmitter, by using a variable resistor. You should hear now the whistle sound clearly on the receiver, once you turn up the variable resistor. Adjust the audio output so that the tone is not over-driven, but the volume similar to your voice when you talked into the transmitter. The sound must be clear without any background noise or distortion. Adjust the input level so that the received signal level is around 100%. If the input level cannot be adjusted up to 100%, leave it as it is. There is an option later in this manual to add RX gain. The quality should be 90% or better. Now you have connected the base station to your radio equipment and roughly adjusted the levels. For fine-tuning, refer to each network description. Finally store the settings using "alsactl store" command. Do this whenever you want to keep your adjustments. Pre-emphasis is used on the transmitter and de-emphasis is used on the receiver side. The nature of FM causes noise amplitude to be proportional to the transmitted frequency. (double frequency = double noise volume) To compensate this, most FM radios, as well as all analog mobile networks use emphasis. As depicted, a frequency of 1000 Hz passes the pre-emphasis without any change. The double frequency (2000 Hz) is amplified to double amplitude (+6 dB). The result is that higher frequencies are transmitted with more deviation (louder) than lower frequencies. On the receiver, the process is reversed. A frequency of 2000 Hz is lowered down to half of it's amplitude (-6 db), so it becomes the original amplitude again. As used before, the loop-back test can be used to verify the signal process, such as level, delay and quality. If command line option '-l 1' or '--loopback 1' is given, a loop-back inside the software is performed. Also the audio signal is sent to the audio adapter, but not received from it. This test is used to debug the software. It can be used to see what the output of an external loop would look like. bnetz.c:351 info   : Entering IDLE state, sending 'Gruppenfreisignal' 2. Base station for channel 1 ready, please tune transmitter to 153.010 MHz and receiver to 148.410 MHz. bnetz.c:524 notice : Received telegramm 'Ziffer 0'. bnetz.c:524 notice : Received telegramm 'Ziffer 1'. bnetz.c:524 notice : Received telegramm 'Ziffer 2'. bnetz.c:524 notice : Received telegramm 'Ziffer 3'. bnetz.c:524 notice : Received telegramm 'Ziffer 4'. If command line option '-l 2' or '--loopback 2' is given, an external loop-back is performed. The receiver needs to be tuned to transmitter, so the software receives its own signal. The received quality level is relevant. It should be not less than 90 for B-Netz. If command line option '-l 3' or '--loopback 3' is given, the audio from the input is sent back to the output. It can be used to check a headset. Everything that is spoken into the microphone should appear on the headphone. Essentially for monitoring the input level is the 'w' key. You will get an ASCII art plot of received audio signal. Press 'w' again to turn off this view. To check measurements like input level and quality, press the 'm' key. You will get an ASCII art plot of differen bar graphs. They show tone / frame level and quality. The green bar shows the current level. The yellow marker shows the last/peak/average level. The light blue marker shows the target level. Some measurement like RF level, frequency offset and peak deviation are only available with SDR. Press 'm' again to turn off this view. Only works with SDR: You can monitor IQ data by pressing 'q' key. You will get an ASCII art plot of received IQ data. Press 'q' again and you will get a logarithmic view of IQ vectors. Press 'q' again to turn off this view. Please monitor this view when the phone tries to call or register. If the dots are yellow, or red, the received signal may overdrive the ADC. Especially when the linear view shows a deformed circle (or even rectangle), reduce RX level. Only works with SDR: Press 's' to get an ASCII art graph of received frequency spectrum. The spectrum's bandwidth is defined by the sample rate (-s) and not by the SDR sample rate! If you don't get nice peaks, but maybe several peaks, you might over-driven the input. Note that the peak will spread by the frequency deviation, so the peak might look noisy on the top. If the peak is quite low, check the input gain. Press 's' again to turn off this view. Current transceiver and call state can be viewed by pressing 'c' key. Press 'c' again to turn off this view. To forward calls, be sure to configure the network with at least two channels that support voice. Add '-x' to your command line. On one phone, enter the number of the other phone and start the call. This example will run a base station with two channel (1 and 4) via two radios connectd to a stereo sound card. The sound card is accessed via '-a hw:0,0'. Because the sound card is stereo, the '-a' option can be given for two channels. The first channel is a combined control+traffic channel and the second a traffic channel. Both channels have different supervisory signals '-0 1 -0 2'. The station code is '-Y se,1'. Refer to NMT section about configuring an NMT network. I highly recommend to use an SDR instead of radios connected to a sound card. In this case I use a Raspberry PI and run NMT network with multiple channels. It is almost at the limit, since I have around 90% CPU usage of the main thread. It wouldn't work to have 2 transceivers at 200KHz Bandwidth without fast math approximation. Use '--fast-math' to increase processing speed.